Anderson grew up as a textile town. Several mills in the area provided the groundwork for a rich and vibrant city while still maintaining its rural roots. When Lake Hartwell was created in the 1950s, it brought those seeking boating and fishing along its 962-mile long shoreline. Anderson is also commonly referred to as the “electric city” as it was the first city in the United States to have a continuous supply of electricity, powered by a water mill on the Rocky River. A statue of William Church Whitner, who devised a method to transport electricity from the river into the city, sits prominently in the downtown city square. Today, Anderson’s downtown offers great dining, eclectic boutiques, museums, and cultural activities that are definitely worth exploring. who moved to downtown Anderson in 2006, have been, and continue to be, instrumental in the downtown’s redevelopment. After housing the Budweiser Clydesdales in their historic Carriage House stable, the Kays realized that there was a barn for the horses but nowhere in town for their caregivers to stay. 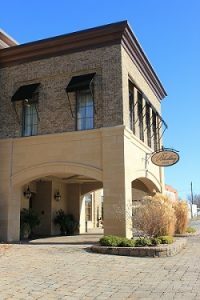 In 2011, the Kays opened the Bleckley Inn, and the Carriage House now serves as the Inn’s event space where weddings and other events are hosted frequently. Spa robes, luxurious linens, and clean and well-decorated rooms are all part of the luxury experience. Nightly milk and homemade cookies top it off, and the complimentary buffet breakfast shouldn’t be missed, with breakfast casseroles, candied bacon, and fresh fruit and pastries. The inn also has an additional eight rooms with their own unique charm located on the downtown square and two fully furnished apartments available for short- and long-term rental. As you stroll along the streets of downtown Anderson, be on the lookout for fish and wrens. Both are part of the city’s art in public spaces initiative. In fact, the city was awarded the 2013 Elizabeth O’Neill Verner Award, the governor’s award for public art and the highest award for art in the state. crosswalks with images from the book, Little Wren Lost and the Teakettle Call, a children’s book featuring original watercolors of icons across the state and in Anderson. In the fall of 2013, Carolina Wren Park opened in the heart of downtown. The park provides an amphitheater with a stage, fountain, splash pad, and dancing lights. 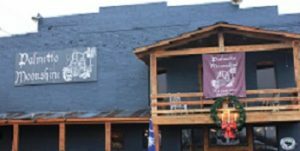 The venue is also home to “The Block Party” presented by Piedmont Natural Gas on Thursday nights from April to October, where thousands gather to hear local bands and enjoy time outside. On Friday and Saturday nights through December 20, children can delight in falling “snow” at the park. Several historic buildings still stand in downtown Anderson, and a self-guided walking tour guide can be obtained from Visit Anderson. Learn about the Chiquola Hotel, constructed in 1888, now home to luxury condos. The circa-1891 Sullivan Hardware Store now serves as an upscale restaurant, aptly called Sullivan’s Metropolitan Grill. For a deeper dive into Anderson’s history, stop by the Anderson County Museum. Displays include the history of the surrounding mill villages and what life was like in the rural county. See the impact that Duke Energy and Lake Hartwell had on the area. Admission to the museum is free. Anderson also has many great dining choices. At Figs Beanery and Creamery you can get your daily java fix, a sweat treat, a scoop of ice cream, or even a sandwich. Located in an old bank building, Doolittle’s Restaurant, where the motto is “Eat. Drink. Do Little,” serves up fresh-made sandwiches, salads, and other specialties. For dinner, Summa Joe’s is a farm-to-table restaurant offering fresh ingredients for dishes from pizzas, pastas, sandwiches, and other specialty dishes. If you’re looking for something a little more upscale, Sullivan’s Metropolitan Restaurant serves up steaks, duck, and fresh seafood. Several boutique and antique shops line Main Street, and the city hosts special events throughout the year. So next time you’re trying to decide on what to do, go explore the Upstate’s own Electric City.